Every country that has a mining industry has mandatory regular mineshaft inspections. However this results in production being interrupted and, as a result, large losses in revenue. Furthermore, engineers must perform inspections in a high-risk and potentially dangerous environment. Canada-based Sight Power Inc is working with Shaft Sinkers Holdings and Parsec in South Africa to develop an innovative automated mineshaft inspection technology and this promises substantial savings and safety improvements. It is based on mobile laser screening and high-resolution imagery and employs Sherborne Sensors’ accelerometers and inclinometers to provide precise positional data and help ensure optimal reliability and accuracy. Characterize and understand the mineshaft environment to refine system design. Automate mineshaft inspection to enable substantial savings and improvements in safety. Obtain highly-accurate geo-reference position data (GPS signals are unavailable underground). Active temperature and error compensation ensure accuracy of results in shaft environment. Dynamic range supports high volume of data capture. Precise and reliable inertial sensors reduce the risk of failure during proof concept. Mineshafts are the lifeline to underground mines. Access to a network of openings used to access the underground resource (typically base and precious metal deposits, coal or diamonds) is obtained using shafts and hoisting systems. They are also used to transport miners and materials and serve as a conduit for cooling and ventilation as well as providing an emergency exit. Mineshaft inspections are a legal requirement in most countries with a mining industry and also vital to ensuring the reliable and safe operation of the mine and its shafts. Thorough visual inspections that take 4-12 hours to complete, depending on the depth of the shaft, are typically undertaken once a week and require the mineshaft to be closed. Subsequent interruption in production results in large losses in revenue for the mine operator. Furthermore, the lack of light and arduous and tiring nature of performing the inspection mean that the potential for human error is high. Unfortunately, serious mine shaft accidents that include fatalities still occur and many of these are due to human error which is exacerbated by the dangerous and high risk environment. The current shaft inspection technique is largely the same as that employed from the dawn of mining – pure visual observation while going down a shaft. There have been attempts to modernize the process, but these have been complementary to the visual method and have never been accepted and fully implemented. The mineshaft is a complex engineering entity. From a geometrical and topological point of view, it can be thought of as a cylinder with a diameter of between 5-20 meters and a depth of anywhere between 100-3,000 meters. The shaft contains a number of constructional elements including: steel beams; pipes of varying diameter; vertical guides (rails for the conveyances); cables and fixing brackets. Commonly the mineshaft’s lining is constructed from reinforced concrete or cast-iron ‘tubbing’ rings. The conventional procedures to check all of the shaft constructional elements is to lower engineers down the shaft of the elevator at a speed below 1 m/sec. However, Canada-based Sight Power is working with Shaft Sinkers and Parsec in South Africa to develop their Mobile Shaft Scanning System (MS3). This is a laser scanning device attached to the conveyance, that moves up and down the shaft significantly faster than conventional manual methods enabling quick and unobtrusive shaft scanning. A realistic 3D image of the entire shaft and its internal infrastructures can then be rendered and imported into software package for analysis. MS3 is based on high-resolution imagery and LiDAR (Light Detection and Ranging) technology. It combines three core elements – a Global Positioning System (GPS), an Inertial Navigation System (INS) and Lasers – into a single platform. This allows the positioning of a laser beam scanning a target to a high degree of accuracy. LiDAR systems are ideal for mineshaft inspection, because the typical distance from the scanning device to objects within the shaft barrel is only 3-4 meters. However, the fact that GPS signals are no available underground presented a significant challenge in terms of obtaining the highly-accurate geo-referenced position data required. Borys Vorobyov, CEO and CTO, Sight Power. Usually, LiDAR devices are mounted on a mobile platform, with an INS recording the precise orientation (pitch, yaw and roll) and a GPS providing accurate geographical information. In the absence of GPS, various positional aids are required to assist the INS used by the MS3 system and these include inertial sensors e.g. inclinometers and accelerometers. Measurements needed to be within 5 mm accuracy (compared with 20-40 mm for common terrestrial systems) so the development team also had to design a much more sophisticated system. The MS3 hardware designers specified only the most precise and reliable instruments and system components, choosing A323 accelerometers and Sherborne Sensors’ DSIC inclinometers. This was to reduce the risk of failure whilst proving the concept and testing the first prototype unit in a real mining environment. We compared products from a number of suppliers and the consensus was that Sherborne Sensors provided the best match for accuracy, price and reputation. It can often be the case with these types of sensors that they don’t perform as expected. However, we checked each unit separately before connecting them up to the MS3 system and they have proven to be very reliable. During the laboratory test phase, the inertial sensors assisted in mapping and characterizing the horizontal test set-up performance as well as indicating any twist, tilt or flex in the MS3 mechanical housing system. These sensors are also used to characterize and understand the mineshaft environment, which will enable Sight Power to refine the MS3 system and its design for optimal reliability and accuracy. 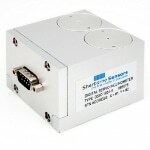 Our gravity reference servo inclinometers and accelerometers are very robust, extremely accurate and field-proven. Their dynamic range means that their output is more conducive to the volume of data required and allows seamless integration into the MS3 data acquisition system. The fact that these inertial sensors are temperature compensated was a key factor in ensuring accuracy of the results, because the temperature can vary dramatically as you travel down the length of a mineshaft. The DSIC high-precision inclinometers measure the amount of pitch and roll of the carriers and give an indication of whether or not the movement down the shaft is controlled well by the guide tracks. The movement of the MS3 system carriers – for example mine cages, counterweights and skips – varies from normal speed to very slow during the cycle of inspection. Therefore, Sherborne Sensors’ A323 accelerometers will measure the performance of the carriers regarding acceleration and vibration during normal operation as well as during inspections. Once location and distance information has been accurately determined, the laser pulses from the scanning device yields direct 3D measurements. This creates a ‘point cloud’ of data that can be interpreted by sophisticated software and built into a Digital Spatial 3D model. The initial model of the mineshaft provides an accurate view of current shaft conditions and can be compared against subsequent scans to determine all changes and their severity and to identify any construction elements that are affected. MS3 will also be able to combine digital images with LiDAR data to create a more realistic 3D picture. Using these 3D images, engineers will be able to immediately determine and highlight areas of concerns e.g. cracks in lining, grounds movements, misalignment and deflections of buntons, guides and pipes. MS3 will improve mine safety, with a reduction in man-hours spent underground in hostile environments and the early detection of defects. It will also mean increased availability of hoisting time and consequently a significant increase in a mine’s revenue and profitability. Crucially, engineers will be able to detect defects at a much earlier stage, cutting shaft maintenance repair costs and downtime and enabling engineers to address any issues before they become a major safety hazard and operational issue. MS3 has, according to Sight Power, the potential to annually reduced production stoppage times by at least 50 per cent. Moving forward, the company aims to determine whether using clusters of low cost but accurate sensors such as accelerometers and inclinometers can remove the requirement for the INS, which would reduce the total cost of the MS3 system.